You will not find a successful athlete who does not become anxious before competition. Most athletes, including Michael Jordan, will tell you that if they aren’t nervous before a big game, they know they have problems. Pre-match anxiety is highly normal and critical to peak performance. This psychological experience is a way for the mind and body to prepare for competition. As humans, we are programmed to identify potential stressors in our environment, which preserves us from danger. For many, playing a tennis match is often both stressful and, on some particular level, dangerous. It threatens our confidence, ego, and sense of self. But this experience does not need to negatively impact our strokes. If we recognize, take action, and effectively channel this enormous source of energy, we can play better than ever imagined. However, if pre-match anxiety, overwhelms us, makes us perceive this feeling as a negative experience, we can fall victim to it and it will negatively impact our tennis game. The examples below demonstrate alternative-playing experiences. On the ride to the club John begins to feel the familiar nervous pangs in his stomach and gradually elevated heart rate. “Uh, oh, there it is again, John thinks to himself.” John then begins to mull over what he might have forgotten. “Damn it. I forgot my headband,” John remembers. His mind begins to race and he begins to think about whom he might play today and how he hates the first round of tournaments. “I know I should have practiced my backhand more this week,” John reflects to himself. His name is called and he reports to the tournament desk. He greets his opponent; they receive the balls and head to their court. In warm-up, John still feels the butterflies in his stomach and this makes him even more nervous and self-conscious. Not wanting to make errors and make this feeling worse, John tries to just get the ball in. He feels tentative and quite anxious. John spent almost the entire match just settling down. In the middle of the second set he finally started to feel more relaxed, but it was too late. Needless to say, John lost the match. Jim wakes up at 8:00am without an alarm having trained over the past week to wake up on his own. Upon awakening, Jim spends 10 minutes saying his positive affirmations, visualizing his match, and planning the morning. He steps out of bed slowly, determined, focused and in the moment. He knows he has a lot to do but he realizes how important it is to stay present and not rush. He hates rushing. It makes him feel nervous and out of control. In an hour, John is ready to leave, thoroughly relaxed and prepared. On the court, Jim has some butterflies and he cherishes this feeling. “It’s going to be a great day today. One point at a time. All about fun,” Jim repeats to himself silently. He begins really hitting out on the ball and going for his shots in an attempt to relax his body even more. By the start of the match Jim feels energized, relaxed, and totally prepared. Jim wins in an easy two set match; playing his best tennis in recent months. In the above examples we see very different responses to similar internal cues. John’s obvious frenetic pace, self-doubt, negativity, and tentative play result from his attitude and lack of preparation. These highly destructive internal feelings and resulting tentative play illustrate how powerful our minds can be. Interpretation and perception are critical factors in developing a more empowering approach to the game, especially in relation to pre-match anxiety. Jim, on the other hand, recognizes the importance of preparation and harnessing this highly aroused state for peak performance. His self-awareness, mental skills, and overall self-control enable Jim to maximize his full potential as a player. Jim still feels some internal anxiety but it does not force him to lose focus or become frenetic or agitated. He maintains his composure, positively reacts to his mental and emotional experience, and takes action appropriately. Pre-match anxiety must be viewed as a positive contributor to peak performance. Individuals in our society have made tremendous accomplishments by using their anxiety to fuel their motivation and narrow their focus. Whether it is in tennis or in life, we must begin to cherish this very normal and useful emotion. However, perceiving the first sign of anxiety as a threat will only push the anxiety higher. At a certain point, too much anxiety will negatively impact our strokes. If the anxiety reaches an unmanageable and uncomfortable point, employing mental skill techniques such as diaphragmatic breathing and muscle relaxation can be enormously beneficial. However, if we take control over our internal self-talk, take our preparation to the next level, and begin developing greater self-awareness we will experience deeper levels of trust and relaxation on the court. 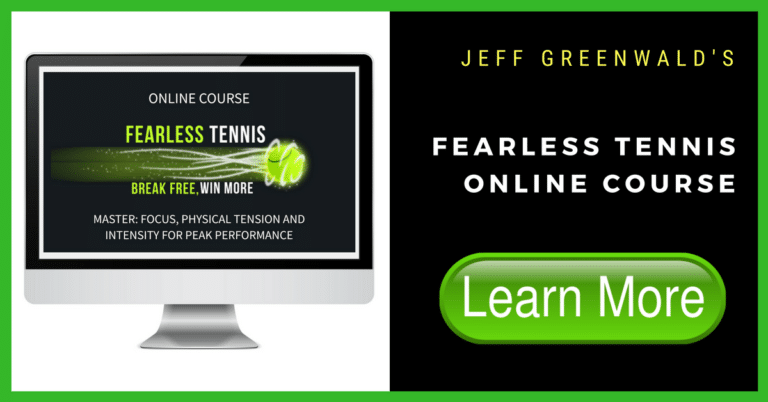 Our reactions to stress, as we have seen above, often make the difference between winning and losing and ultimately our enjoyment on the tennis court.